Easy website to handle. Great colors and options! Can customize whatever you want to make it suit your needs. nice clean design with good calls to action built into home page. Make use of this powerful template for any business related site for faster and easier web development. Vivid coral hues opposed to pure white background work as great attention grabbers. Circular elements add to the general visual appeal of this theme, making it so elegant and refined. Grids allow saving on space, whereas informative and usable footer leads to other meaningful areas of your site. The theme is powered by Cherry Framework, it's fully responsive, cross browser compatible, and SEO friendly. Pick it if you want to stand above competitors. It doesn't matter in case you already have got clientele talking a different foreign language, or only decide to enlarge your business to foreign countries - WPML plugin will help you with this. It is actually appropriate for lots of the modern day page builders and also CMS. This means you don't need to be concerned about it. A parallax scrolling is a method in web design when background picture shifts at a slower pace compared to a front content, forming the impression of multi-level effect. Parallax enable your potential customers interact with your website and have far better customer experience. It allows you you to stand out among your competitors. The Search Engine Friendly internet site enables any searcher to get every web page of the internet site, outline the content and index all of them in the database. Search Engine Friendly themes will help you enhance your internet page ranking in search end result. Portfolio gives a method to showcase your primary skill sets and projects in a successful way. Portfolio website pages become more and more trendy for modern day designers, professional photographers not to mention developers. Potential clients or organizations can check your proficiencies from the very first stop at your web property and quickly decide if they want to employ you. Bootstrap is an open source grid-based framework that allows the creation of mobile-ready websites. Bootstrap is extremely adjustable for any modification. It's simple to work with, features a great grid system and considerable elements range. Responsive design ensures that the website page adjusts its size and shape to suit almost any screen, from the smallest devices to the largest Computer screens. For each and every device, web page components enlarge or lessen to appear ideal. Regardless of type of gadget your potential customers might utilize to enter the web-site - they are going to observe a stunning picture having a practical navigation menu. It's an especially fundamental feature, bearing in mind that a good number of visitors now choose their mobile devices for internet surfing. What is the price for acquiring the extended license for WordPress theme for Businessman ? There is no set price for acquiring the extended license. The price is based on the WordPress theme for Businessman 's unique price for those templates you would like to use for the integration. The price for purchasing license for a single template is half of the template unique price. Will TemplateMonster help me to edit my WordPress theme for Financial Company? TemplateMonster offers you a variety of sources to help you with your WordPress theme for Financial Company. Use our comprehensive Online Help Center to get the basic knowledge about your WordPress theme for Financial Company. Our Knowledgebase contains customers questions and most frequent problems. Anyway, you can always use TemplateMonster 24/7 phone support, try our Ticket System or Live Support Chat to get qualified assistance from our support representatives. Are images included in the WordPress themes for Business Company released under GPLv3.0 license? In the WordPress themes for Business Company released under GNU GPL v3.0 images are not included and are used for demo purposes only. Can I put a line at the bottom (or any other spot) of my new product "Website development by Company name" after purchasing WP template for Business Firm? Yes, you can place a note at the bottom (or any other spot) of my product "Website development by Company name". Nevertheless, you cannot place "Website design by Company name"while using one of WP template for Business Firm. What is a one time usage license for a WordPress theme for Online Bank? When you buy the WordPress theme for Online Bank at usual price you automatically get the one time usage license. It enables you to use each individual product on a single website only, belonging to either you or your client. You have to purchase the same template again if you plan to use the same design in connection with another or other projects. When passing files to your client please delete the template files from your computer. Are there any limitations on selling the WP template for Business Firm as the integral part of my new product? Is it reasonable to make unique purchase of WP template for Internet Bank that was already purchased before? Yes, it's reasonable to make a unique purchase of WP template for Internet Bank. Because there is very small chance that you will find the same design on the net. There are more than 3,000,000,000 webpages online now according to statistics on www.google.com. Can I contact the WP template for Business & Services author? Yes. You can contact this WP template for Business & Services author/author's team directly using your personal account under the Support tab. What is a unique purchase license for Banking WP theme? 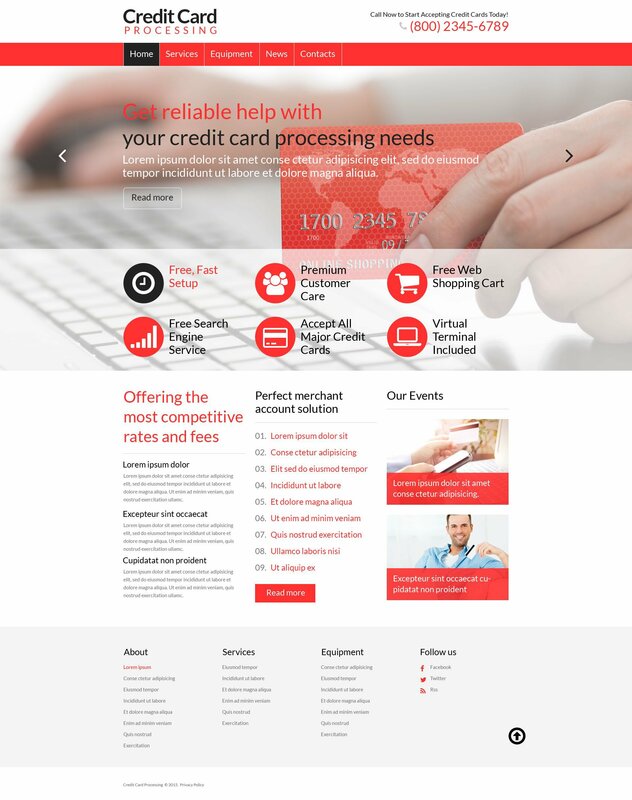 If you purchase the product at a â€˜Unique price' it guarantees that you are the first and the last person to buy this Banking WP theme from us. It means that this template has not been sold before and you become an owner of a unique design. After this kind of purchase the template is being permanently removed from our sales directory and is never available to other customers again. The unique purchase license allows you to develop the unlimited number of projects based on this template, but the template should be customized differently for every project. Can I resell the WordPress template for Account Checking as is? No, you cannot resell the WordPress template for Account Checking as is. Make sure that these charges for Finance WordPress design theme have different order IDs. If it is so, contact our billing department. What do I receive when I order a Finance WordPress design theme from TemplateMonster.com? After you complete the payment via our secure form you will receive the instructions for downloading the Finance WordPress design theme. The source files in the download package can vary based on the type of the product you have purchased.If you need unzipping software to open the .zip archive, Windows users may visit www.WinZip.com, Mac users may visit www.StuffIt.com. How can I modify WordPress template for Finance to suit my particular website? Please visit our Online Help Center to obtain detailed instructions on editing WordPress template for Finance. Can I customize the Bank WordPress theme? Yes, you can customize the Bank WordPress theme to any extent needed. You cannot use a header of the template for one project though, and images from the template for the other project. Can I put a line at the bottom ( or any other spot) of the customized Banking WP theme "Website design by Company name"? No, you cannot place a line at the bottom ( or any other spot) of the customized Banking WP theme saying "Website design by Company name". Nevertheless, you can place "Customized by Company name". Can I resell the customized WordPress design for Finance Articles? Yes, you can redistribute WordPress design for Finance Articles under the terms of the GPL as well. Can I put low resolution thumbnails of Banker WordPress designs on my website for my clients to choose designs? Will you help me to customize my Corporate WordPress design? We do not provide any help or instructions on Corporate WordPress design customization except for www.template-help.com help center. If you are not sure you can customize the template yourself we recommend to hire a design studio to customize the template for you. Can I get the extended license for some other pricing than the half of the initial WP template for Business Bureau price? No. The price for purchasing license for a single WP template for Business Bureau is the half of the template unique price. What is Extended License for WordPress template for Bank? What am I allowed and not allowed to do with the WP templates for Finance Articles? You may: Build a website using the WordPress theme for Financial Company in any way you like.You may not:Resell or redistribute templates (like we do).Claim intellectual or exclusive ownership to any of our products, modified or unmodified. All products are property of content providing companies and individuals.Make more than one project using the same template (you have to purchase the same template once more in order to make another project with the same design). Is it possible to buy the particular image from the WP theme for Finance News? No. According to our Terms and Conditions we never sell the images separately from Small Business WordPress design themes (as well as the templates separately from the images). This template is great quality and very easy to use from the administration side. I&#039;m very pleased. tks for the template, incredible! i am using this theme as a back frame to create a different industry website. The Layout and theme function fits my needs perfectly.